Everything you need to know about Austrian Gold Philharmonicas or Österreich Wiener Philharmoniker Münze aus Geld. Many countries now issue a one ounce bullion coin, to be sold at a very low premium over the intrinsic gold value. The Austrian version is the Philharmonica or Philharmoniker, and was introduced in 1989, and is produced at the Austrian Mint in Vienna. Its design celebrates the Vienna Philharmonic Orchestra, considered by many to be the finest in the world. 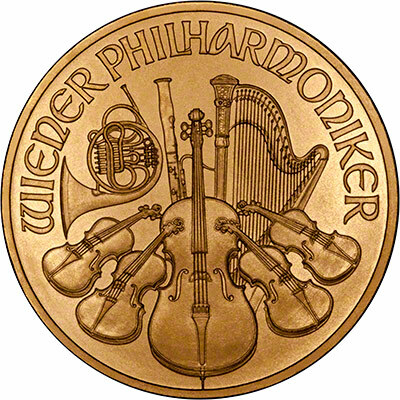 The gold used in the production of the Philharmonica coins is also, at .9999, the finest in the world! 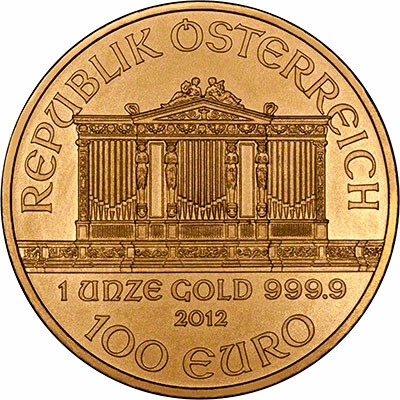 The great organ in the Golden Hall in Vienna's concert hall (Musikverein) is the theme for the obverse side of the coin. This is the home of the Vienna Philharmonic Orchestra. Also featured on this side are the face value in Austrian Schillings plus the weight, fineness and year of issue. A harmonious design of musical instruments representing the world famous Vienna Philharmonic Orchestra. Gold Philharmonicas are available in four different sizes and weights, from one ounce to one tenth of an ounce, as detailed below. From 2002 onwards the denomination or face value of the Philharmoniker series has been changed from Schillings to Euros.